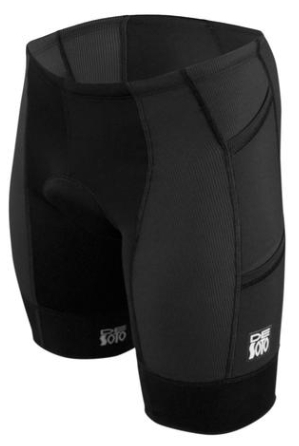 With a total of four pockets and the Mobius Comfort Compression leg-bands, this is well considered to be one of the best short for long and ultra distance racing. 1" (2.54cm) lower in the rise than previous models making it more of a regular rise than a high rise. This piece sits just below the hip bones. 4mm Clasico Integrated Pad is softer with more stretch. The pad is sewn onto the surrounding panels instead of inside the garment, so there are no seams on any part of where you sit. We have eliminated the Ceramico beads. Now on the outside you will find Liftfoil™ fabric that covers the pad. It is smooth and allows for easier fore and aft movement on the saddle. Seamless inner thigh eliminates friction and increases durability. 3-inch 2-piece Mobius™ Comfort Compression leg-bands that offer compression without tight constriction (read details below). No gripper elastic nor binding legbands that cause a tight squeeze of the thighs. Solid black Liftfoil™ center panels providing even more comfort and durability. We intentionally kept these as black “modesty” panels in the crotch area of all models including the white version to avoid saddle stains while creating a more flattering appearance. Liftfoil™ is our swimskin fabric. The Liftfoil™ Speed Trisuit is made entirely out of this swimskin fabric. 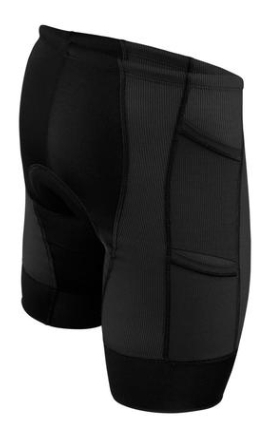 The addition of these panels on the front and back not only makes this trishort faster, but they eliminate any adverse affects when worn with a wetsuit. Four Pockets, two on each outer thigh, one above the other, made of Forza Compressor fabric to hold things in place. If the pockets are empty there is zero drag as speeds of 5mph (8kph) or less. The fastest triathletes in the world do not swim 5 mph. Curvilinear™ seamlines, and contrast flatstitch offer support, comfort and both aerodynamic and hydrodynamic advantage making it great for nonwetsuit races. Zero-Stetch flat drawcord and elastic waistband keeps the shorts in place even when wet. Swim, bike, and run in comfort without changing. Wears well under your wetsuit! Disclaimer: swimming in murky water, including ponds, streams, bays, etc. may cause staining to white colored items. This environmentally-friendly innovation is completely free of solvents and the dyes used have no VOC. A Mobius Strip is a surface with only one side and one boundary. Mobius™ Comfort is our new form-fitting, yet non-binding compressive fabric. The knit we created when blending fibers make repeated mobius loops so that the same surface, stretch, and rebound is on both sides of the fabric and in equal direction. You will notice comfort and support without constriction, opacity without unnecessary weight, and durability from a very smooth surface on both sides. In addition to the bibshort and trishort made entirely of this fabric, you will find Mobius Comfort leg bands on all our trishorts, bike shorts, and bib shorts. IS THE CLASICO PAD DIFFERENT FROM THE CERAMICO PAD? Yes, the Clasico Pad different from the Ceramico pad we offered previously. First lets be clear on what remains the same. The pad is still the same size, same thickness, same density, and same buoyancy. It is still an integrated pad, meaning that it all the panels are sewn around the pad, so it has no stitching down the middle. The difference is that instead of the ceramic beads which were laminated to fabric that is laminated to the other side of the pad, we opted for covering it with fabric on the outside of the short. In essence we removed two layers of lamination which caused a perception of stiffness, especially when the short was new. The new Clasico Pad looks less obvious, and it also allows the pad to stretch more than the Ceramico pad. In an effort to keep improving our pads, the Clasico Integrated Pad offers the same padding, but with more stretch in every direction, and more comfort from the first time you wear it. Awsome fit, great compression. Must buy!